Polycystic ovary is a pretty common condition. About one in four women have it and of these 7% have polycystic ovary syndrome. There are many myths surrounding polycystic ovary. Women who are found to have polycystic ovaries on an ultrasound scan may have regular periods and do not have polycystic ovary syndrome, which is characterized by irregular periods, excessive body hair, acne, weight problems, infertility issues, and other symptoms. Most women who have polycystic ovaries are unaware of it as there are hardly any symptoms. It does not cause pain. The pain could be due to ovulation or a simple cyst which normally disappear without any treatment. In order to diagnose a polycystic ovary, a doctor may use one of the three tools: abdominal ultrasound, vaginal ultrasound, or laparoscopy. Of these, vaginal ultrasound is most recommended as the abdominal ultrasound does not provide a precise picture and laparoscopy is an invasive surgical procedure. Polycystic ovaries tend to run in families leading to a belief that it may be a genetic problem. But recent studies have shown that it may be a result of combined genetic and environmental factors. 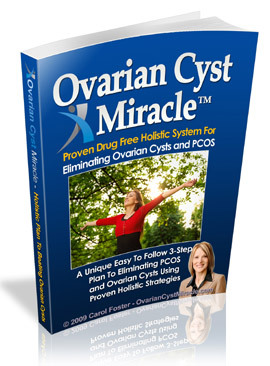 Polycystic ovaries, if unaccompanied by any other symptoms, do not require any treatment. Since the cause of the polycystic ovary is unclear, medications may just be like shooting in the dark. Though there may be no symptoms, it is not a normal anatomical or physiological feature and due to the myths surrounding it, could cause emotional problems in the patient. It is recommended that the patient undergo treatment from a holistic medicine practitioner. He/she will help eliminate the root cause of the problem and halt the progress of the syndrome. This treatment is safe, permanent, and totally without side effects.